A week with lots of travel produces a variety of views out the front window. This was our view out the front window at Flying J in Olive Branch, Mississippi. 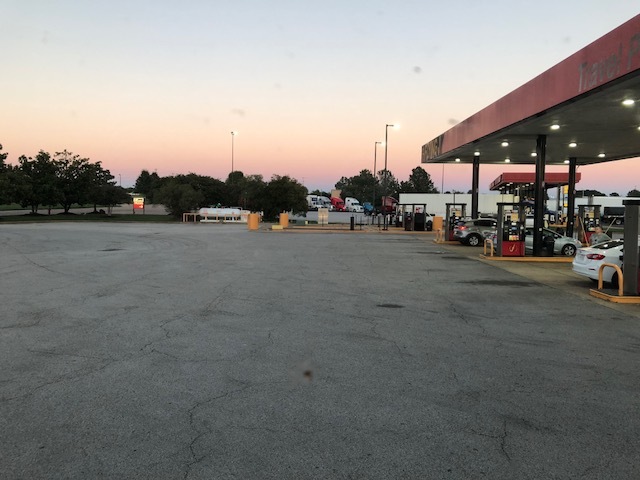 This was our view out the front window at the Flying J near Greenville, Alabama. This was our view out the front window for part of the week at River Springs Camp near McKenzie, Alabama. I backed the tent trailer near the tabernacle so that we could fold down the back door onto the concrete and easily load the sound equipment at night. Every revival should be that easy. This is our view this week in Richton, Mississippi. The tent is just to the right of our view out the front window. Thank you for joining us today on Mile Markers. I hope you have a tremendous Sunday. Pray for us as we begin tent revival tonight in Richton, Mississippi. We would love to have a tremendous harvest of souls!